This serum is very easy to use. Just once a day apply it to your brows and right at your lashline. The serum absorbs quickly and there's no heavy or wet feeling. I haven't experienced any irritation at all. There has been rigorous testing in an independant lab under dermatologist supervision to ensure your peace of mind that there will be no allergy or irritation from this product. 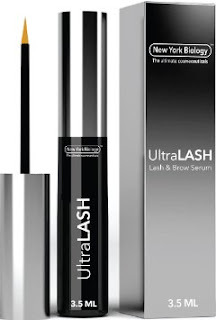 The lab test in clinical trials show that using the serum daily users found that 25% growth and thickness to their lashes after 2 weeks of use and 75% increase after 6 weeks of regular use. The results were studied over a panel of applicants and measured with SigmaScan software. This serum is made in the USA in FDA approved cGMP facility using only the highest quality ingredients. It does not contain alcohol, parabens, or sulfates and is Cruelty Free. I haven't been using this serum long enough to see a lot of growth yet but my lashes and brows and fuller and look well conditioned. Better than they have looked in many years.